All American Rejects played at UMD’s Art Attack 2007 this past Friday evening. I was there all day lending a hand where I could, providing the 2-3 minute spotlight training to some volunteers, cabling the truss incorrectly, and generally enjoying the warm weather otherwise. Overall it was a really good time without too many noticeably snags. The Mikey/Tabisz team don’t receive enough credit for organizing/handling the event the way that they did: excellently. Pictures of the event here, here, and (unfortunately, sorry Bolly) here. Meanwhile, here’s a few YouTube videos from the headliner’s set. Otto — the AAR sound engineer — plays Collective Soul for intro/exit music, as well as prior to the (planned) encore. Except for the one mentioned (and embedded here), all were taken from the crowd and are a bit shaky. 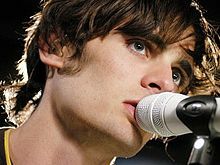 I wish there was some from when lead vocalist Tyson Ritter (who dates Kim Smith, the lucky devil) decided to take his act into the bleachers (or damned near to it). I take no credit for any of these, I didn’t even bring my camera. All of ‘em are plugs for LightingbyMAddy. If you can fill in the list, drop a comment with a YouTube link.